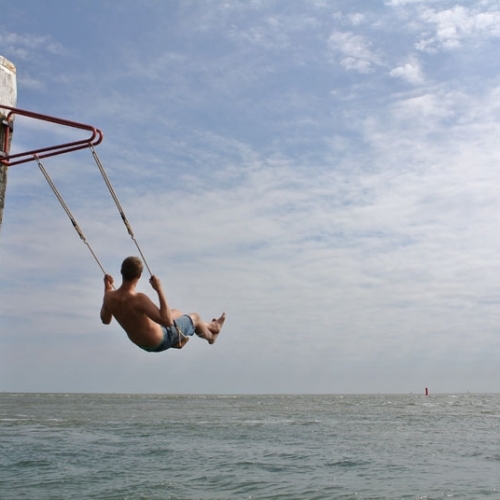 The LAnd Magazine is coming soon! 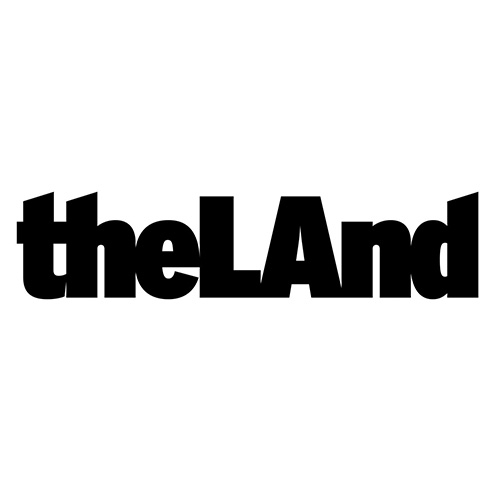 "The spirit of the alt-weekly is still alive in Los Angeles: A conversation with Jennifer Swann, co-editor of The LAnd magazine." in The Outline. ‘First Gear’ by London-based V2 Studios. 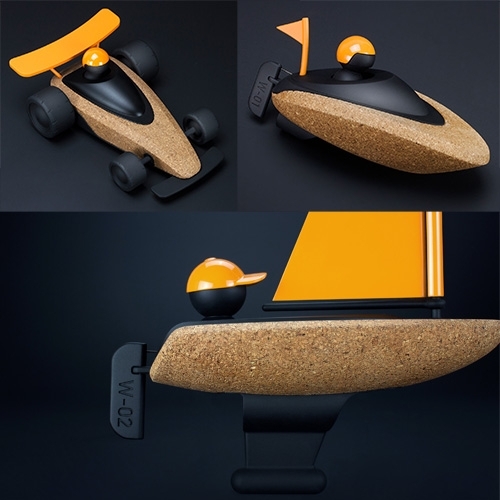 The minimalist toys are also eco-friendly, using cork and plastic parts made from 100% post-consumer recycled high density polyethylene and 100% recyclable packing printed with soy based dyes. 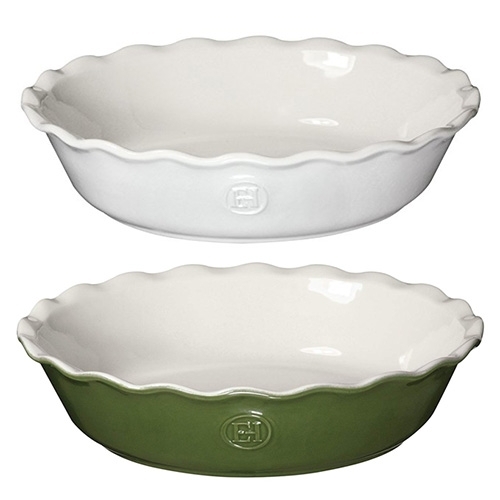 Emile Henry Modern Classics Pie Dish. Impulse bought this for strawberry cake (#63277) and have been loving it for pies, cakes, casseroles, and more! 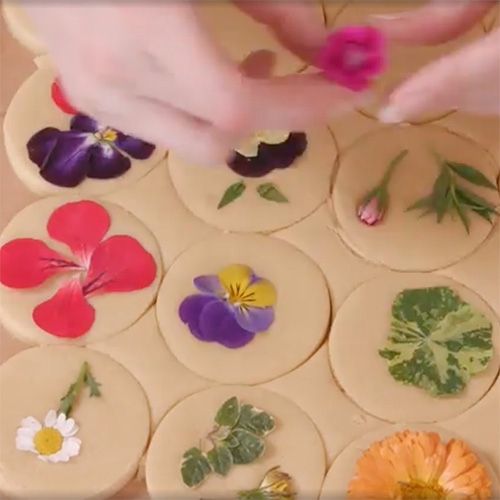 Vogue has a video recipe with Lori A. Stern to make her lovely Flower Pressed Shortbread Cookies from #63251. 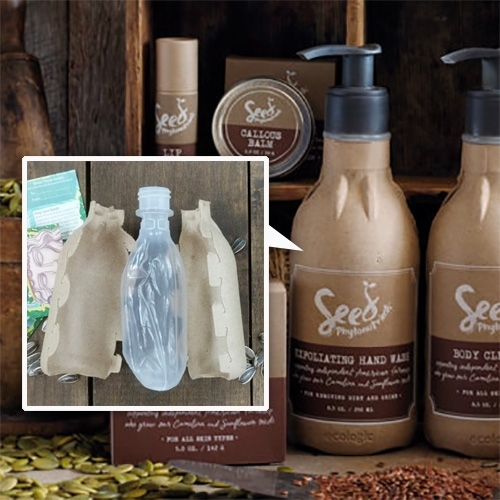 Seed Phytonutrients are packaged in a "shower-friendly post-consumer recycled paper bottle" made by Ecologic. Apparently "The plastic liner is so thin—95 percent thinner than conventional bottles— that it collapses as it’s used." Sorry I Have No Filter from Sagmeister & Walsh. 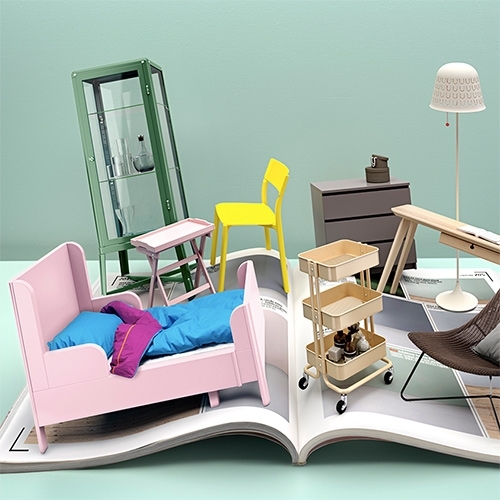 Clothes, pins, totes, pillows, phone cases, etc that are an updated twist on their Still Nasty collection (#62016). 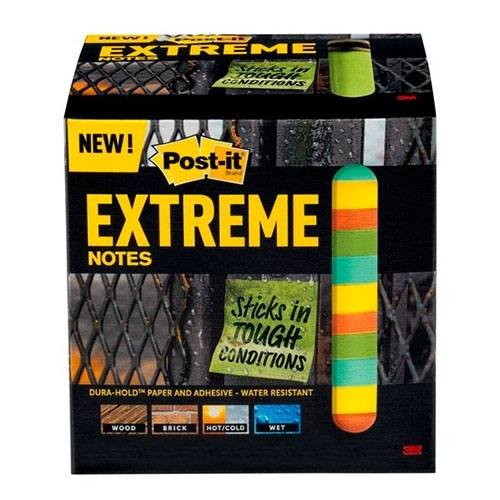 Post-it Extreme Notes! 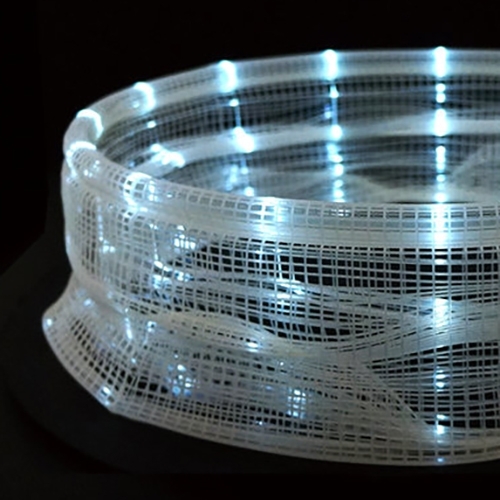 Water resistant, durable and writable. 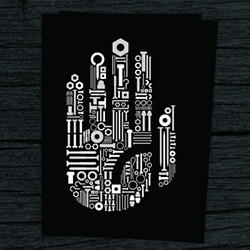 Made with ultra-strong Dura-Hold Paper and Adhesive. Sticks to textured surfaces and in tough conditions. Sticks in hot and cold environments. 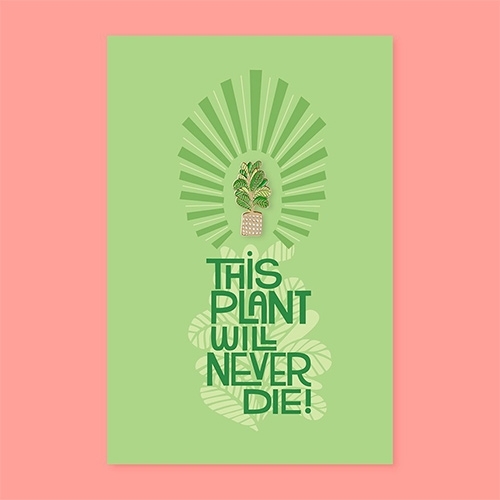 "This plant will never die!" card with a Fiddle Leaf Pin by The Good Twin. Olive & June Saturday Sandals - the perfect post-pedicure sandal you can tie a multitude of ways without touching your toes. 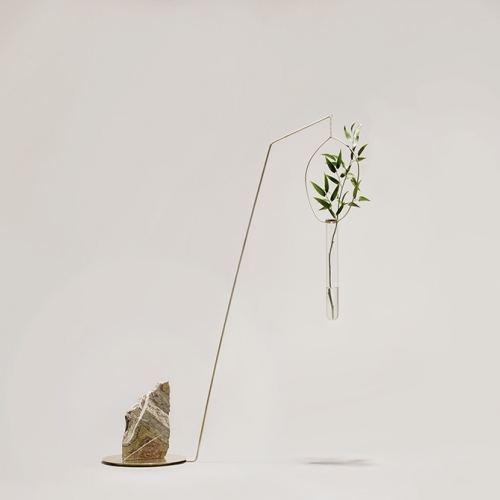 EDEN, Kinetic sculptures that celebrate natural beauty and balance by Agustina Bottoni. Congrats to all the medal winning Olympians - female and male! Poignant post in Babe - "Congrats girl! Fiancé of former Miss California scoops his 25th medal: AKA – if we talked about male Olympians the way we talk about female athletes"
IKEA PS Collection 2017! 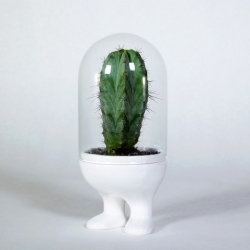 Dezeen gives us a peek at the preview - and this year is all about minimizing waste. 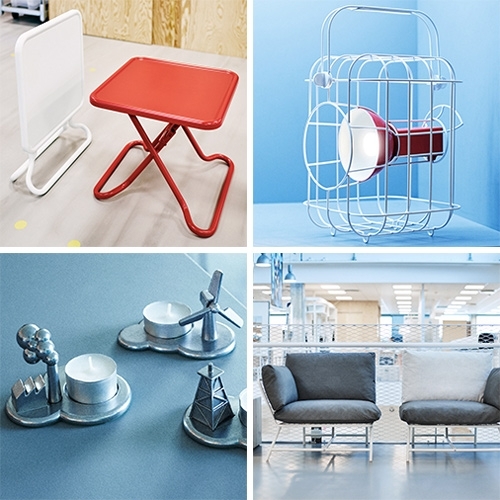 They collaborated with 21 designers to create 60 products focused on "high design values at a great price". Window Seat Please. 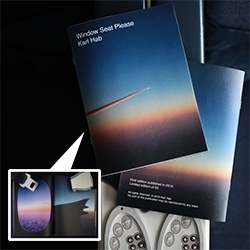 A limited edition zine by Karl Hab sharing 10 years of window seat views. 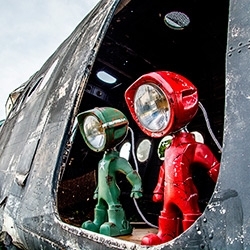 Reminds me of the NOTCOT "Operation: Window Seat" posts! 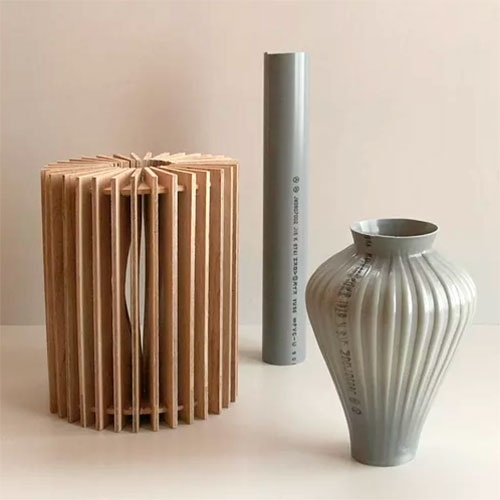 In an effort to share great designs and designers with others, Jung Soo Park started creating pixelated interpretations of iconic designs from the history to post on Instagram with little nuggets of information about each piece. 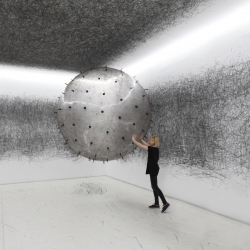 ADA is an analog interactive installation, kinetic sculpture, and post-digital drawing machine by Karina Smigla-Bobinski. 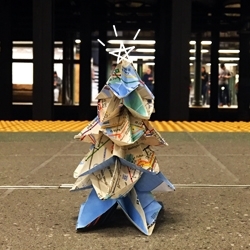 The "Architect's Christmas Tree" version 2.0 - this time with the NYC subway map! The post includes instructions for you to make your own. VIDEODUELS - From Bruton Stroube, the creators of the Slo-Mo Booth (#54107) comes the sequel with a full back-alley set, 3 Phantom HD Gold cameras, and 6 racks of costumes and props and duelers fueled by 6 kegs of beer. 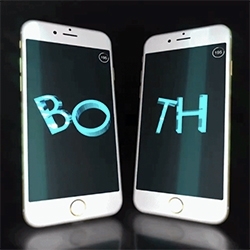 VIDEOApparently it will take 2 phones to watch yungjake's music video via snapchat... BOTH. Looks like a BFF necklace split in two? 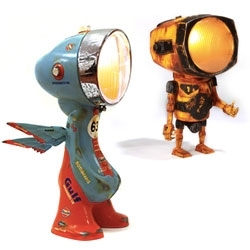 MAD WORLD - The vehicles of Fury Road. 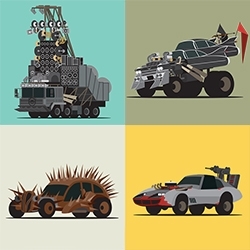 Amazing series of illustrations from Scott Park inspired by Mad Max! 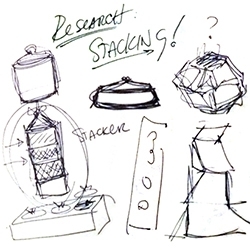 FEATUREDRESEARCH: Stacking + Totems. 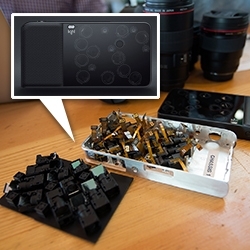 Since NOTCOT is where all my inspiration lives, here's the first (ever evolving) NOTlabs Research post as i dive back into the archives and around the internet on things i'm thinking about for experiments/projects! The Good Twin Co. Pin + Post Cards! 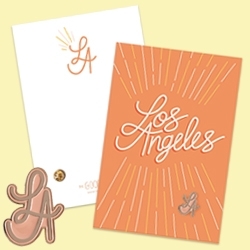 Cities, Horoscopes, and more little enamel pins mixed with 4"x6" cards you can give to a friend. 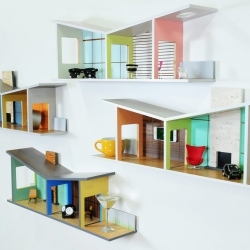 The first edition of the House Shelves is a series of wall-mounted shelves inspired by the post modern architecture in Palm Springs. The Walled Estates are designed to hold items that don’t necessarily have a home – such as keys, glasses and mail. 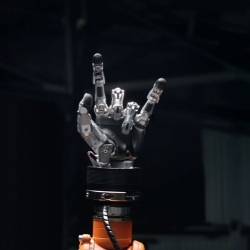 VIDEOOne year later (#56963) after losing against the champion Timo Boll in table tennis, KUKA robot asked for revenge. 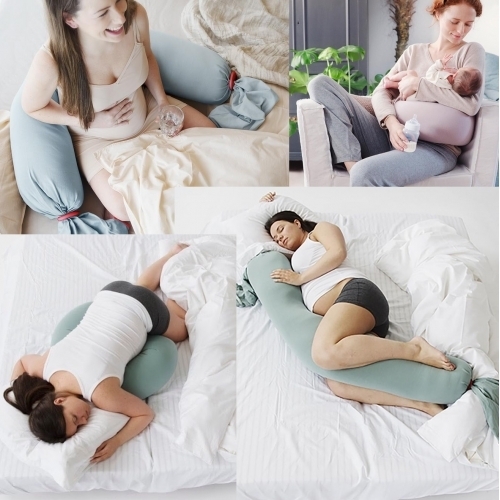 See the different kind of challenge, for both, with the new and surprising set of rules. 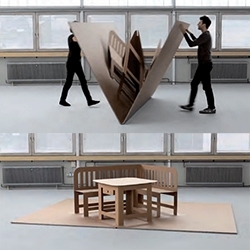 Liddy Scheffknecht's POP UP furniture is like a life sized pop up book! 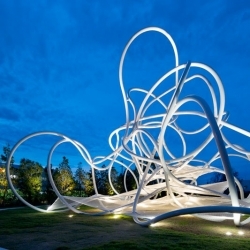 Forest Loops, a sculptural playground in Hamakita, Japan by Suppose Design Office. 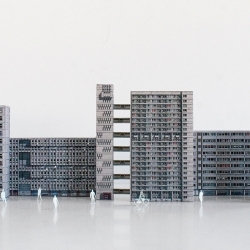 A collection of paper cut-out models representing brutalist architecture of London from 1960s-1970s. 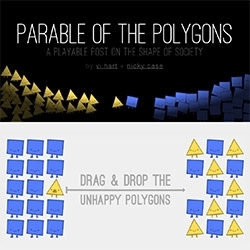 Parable of the Polygons - an interactive post by Vi Hart and Nicky Case. Both fascinating from a usability/creativity perspective and from a content perspective as it helps illustrate Schelling's Dynamic Models of Segregation. 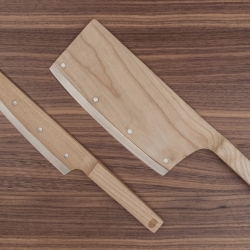 Maple Set, a Red Dot Design Award winner is now available for pre-order! 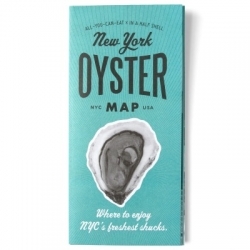 The New York Oyster Map features 30 great places to slurp the freshest shucks in the city, curated by oyster expert and bivalve blogger Julie Qiu of In A Half Shell. There are also Diner, Burger, and Ramen Maps! 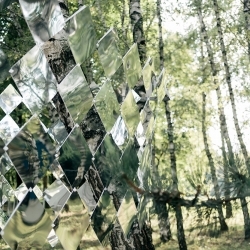 Mirage pavilion for Sziget Festival 2014, by Studio Nomad. 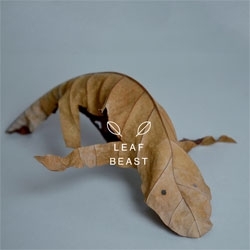 Leaf Beast. Baku Maeda turns dried magnolia leaves into creatures! 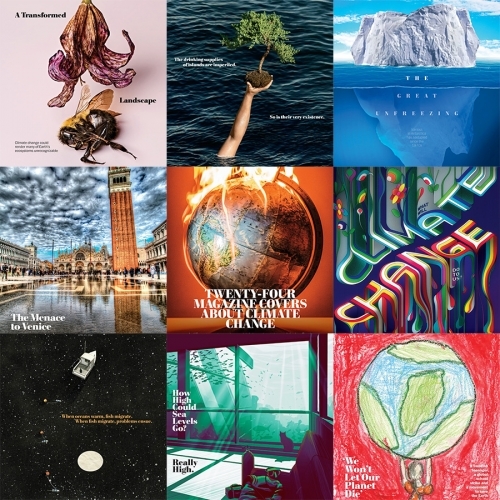 Post Club HQ is a subscription Postcard Print service! 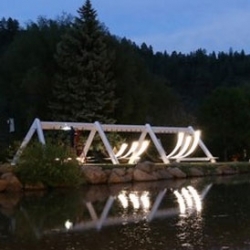 The August 2014 issue is "Use yer hands"
FEATUREDNOTFZJ80 Project: Test Trip, Big Bear! First part is testing out camping. 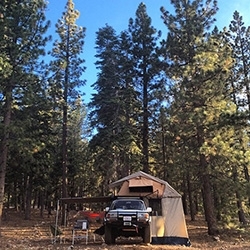 From popping the rooftop tent, annex, and awning, to cooking a few meals and curling up under the stars we explore dispersed and yellow post camping. 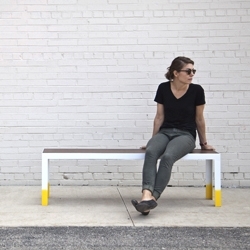 Dip Bench, rubber dipped feet with walnut wood top. Built to order by Synecdoche. 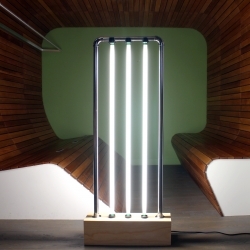 A bold post-modern vertical fluorescent lamp, inspired by Gian Nicola's Gigante floor lamp (c.1981). 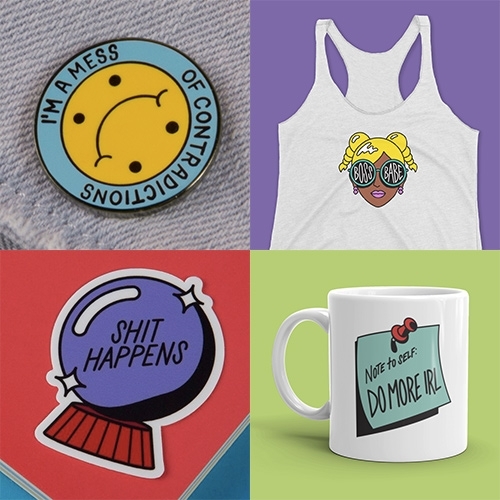 All made with off the shelf items! 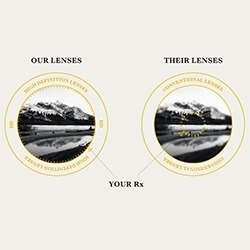 The Making Of David Kind Luxury Optic Lenses - interesting to see how these high end Trivex prescription eye glass lenses are made. 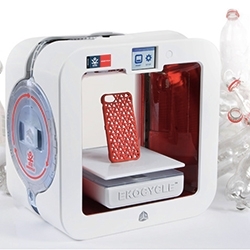 EKOCYCLE Cube - latest 3D System Cubify 3D Printer that prints in post-consumer waste. Apparently each EKOCYCLE Filament Cartridge contains 25% of post-consumer recycled materials, using an average of 3 assorted recycled 20oz PET plastic bottles.